Global appliance brand Haier aims to reach new heights when it comes to creating everyday items for the home. Claimed to be one of the top appliance companies in China, Haier says it aims to listen to its customers to offer ‘practical, smart and reliable value for money home solutions’. Some of its products include cooktops, built in ovens, refrigerators, freezers, bar fridges, wine chillers, freestanding ranges, washing machines, clothes dryers and air conditioners. Read on for specific reviews of some of Haier’s standout dishwashers. For larger loads, Haier offers products like the stainless steel Haier HDW15G3X dishwasher and the white Haier HDW15G3W dishwasher with 15 place settings. These models have nine wash programs such as ‘Fast 30min’, ‘Rinse’ and ‘Heavy 70°C’. Compared to the brand’s compact dishwashers, the five-star water rating and 3.5 energy rating might make these models a more environmentally and wallet-friendly option. 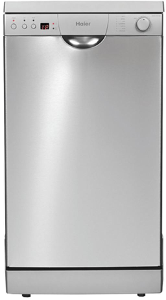 Featuring 14 place settings, the white Haier HDW14G2W dishwasher is one of the largest available from the brand. These models come with many of the same features as products like the Haier HDW15G3X and Haier HDW15G3W but have six programs. Some of these include ‘Glass-Auto’, ‘Auto 45–70°C’ and ‘Pre-Rinse’. 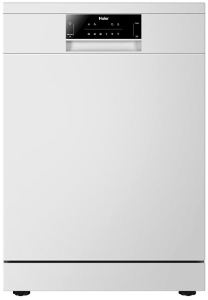 The Haier HDW14G2W and HDW14G2X models have 3.5 star energy efficiency ratings and five-star water ratings. Similar models, like the Haier HDW13G1X, which has 13 place settings, has a three-star energy rating and 4.5 water rating. Certain models like the white Haier DW12-TFE4WH dishwasher are exclusively available from certain Masters Home Improvement stores. These come with 12 place settings and have four-star water ratings and two-star energy ratings. The models include seven wash programs, including ‘heavy’, ‘light’, ‘rinse’, ‘pre-rinse’ and ‘Quick 30’. Other features include a removable twin cutlery basket, Half Load and height adjustable upper baskets. A bigger dishwasher isn’t necessarily better. For couples and small families, Haier offers a number of smaller, compact dishwashers to suit smaller washing loads. 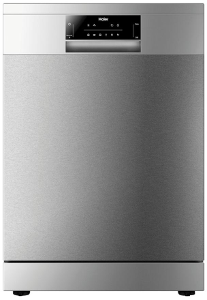 Some of these include the stainless steel Haier HDW9TFE3SS2 dishwasher and the white HDW9TFE3WH dishwasher. But with a two-star energy rating and 2.5-star water rating, the efficiency of these compact appliances tend to be lower compared to other larger models like the Haier HDW15G3X and Haier HDW14G2W. Including nine place settings, these models offer seven wash programs claimed to help make cleaning up easier. Some of these are the ‘Glassware’, ‘Quick 30’ and ‘Pre-rinse. Other functions include a delay start function for up to 24 hours, LED display, water heating indicator and rinse aid indicator. Safety features like a concealed heating element and overflow flood protection are also included. To maintain a sleek design in the kitchen, these models also have a finger mark resistant finish and a counter balanced door. Should I buy a Haier dishwasher? From the half load function to the different quick wash options, Haier offers a number of appliances with features claimed to provide a more tailored clean depending on what you want to wash and how you want to clean your dishes. Many of its dishwashers are available in the standard size and in a range of styles and finishes. For smaller loads, compact dishwashers like the stainless steel Haier HDW9TFE3SS2 dishwasher and the white HDW9TFE3WH dishwasher might be suitable options. While these offer only nine place settings, there are still seven wash programs similar to models with larger capacities, such as the DW12-TFE4WH. Households with larger loads can alternatively opt for products like the Haier HDW15G3X dishwasher or Haier HDW14G2W. Find out which dishwasher could be best for you by comparing a variety of brands via the link below.